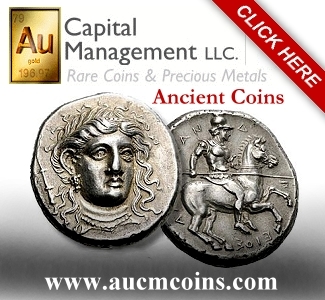 Home Ancient Coins Ancient Coins: What About Spartan Coins ? 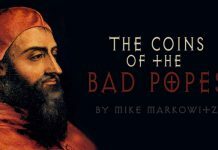 CoinWeek Ancient Coin Series by Mike Markowitz …..
Spartans disdained many things that other ancient Greeks valued. One of these things was money, even coins. HUNDREDS OF GREEK CITIES issued coins between the birth of coined money around 650 BCE and the end of Greek civic coinage some time after 300 CE. The apparent exception was Sparta. The purpose of this policy was to discourage Spartans from accumulating wealth so they could focus their energies on preparation for war. 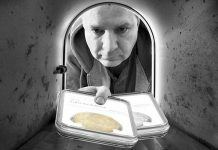 Plutarch’s chronology is shaky – if Lycurgus actually existed, he probably lived a century before Greeks began to use coins. 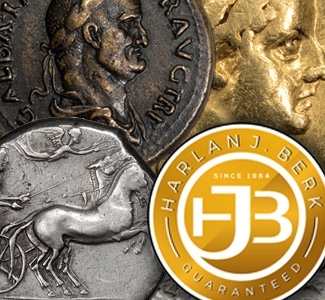 The Greek word for roasting spits (obeloi,) however, is closely related to the word for a small silver coin (obol), so the connection is credible. Among themselves, Spartans might use awkward bundles of iron spits for legal or ceremonial transactions, but in dealings with other Greeks they had to use current money. Because of their selective breeding and superb physical fitness, Spartans were serious contenders in the Olympic Games. 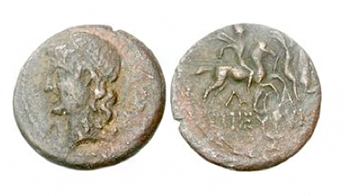 And all Greeks attending the games, even Spartans, used the special coinage struck by the city of Elis, which managed the sacred site of Olympia. 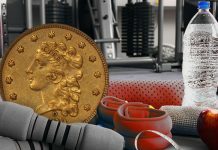 Because Sparta sometimes allied with Persia and received Persian subsidies during its long wars with Athens, Spartans would have been familiar with the Persian daric – at 8.4 grams and over 95% pure, the most common high-value gold coin used by Greeks before the time of Alexander the Great. While other Greeks experimented with exotic political innovations like democracy, oligarchy, and tyranny, conservative Sparta clung stubbornly to its archaic dual monarchy: two equal kings from different dynastic families, the Agiads and the Eurypontids. It made sense to have a spare king on hand, considering the high risk that at least one king in every generation would die in battle. Areus, a member of the Agiad dynasty who ruled from 309 to 265 BCE, was the first Spartan king to issue coins in his own name. This break with tradition was driven by the need to pay mercenaries in his war against Macedonia, Sparta no longer having the manpower to raise a citizen army. 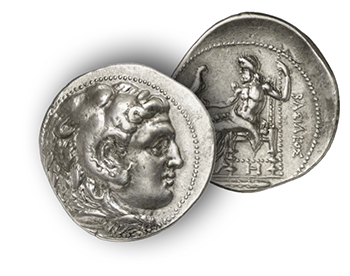 Ironically, Areus’s silver tetradrachm was closely modeled on the widely circulating Macedonian coinage of Alexander, with the head of Herakles on the obverse and an image of Zeus enthroned holding an eagle on the reverse. Only the inscription “King Areus” indicates the source. Just four examples of this remarkable coin are known; three in museums. 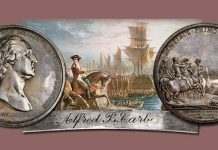 Areus also issued rare silver obols, suggesting a need for small change. 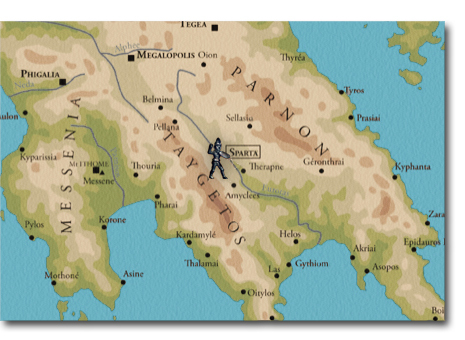 Fighting the Macedonians outside Corinth, Areus was killed in 265 BCE. 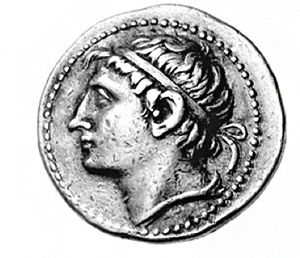 Cleomenes (ruled 235-222 BCE) placed a realistic portrait of himself wearing the diadem (a golden headband that symbolized Hellenistic monarchy) on his silver tetradrachms. On the reverse, along with the abbreviation Lambda-Alpha (for Lakedaimon, the name Spartans gave their territory) was the image of Orthia, an ancient local nature goddess identified with Artemis, sister of Apollo and goddess of hunting. Cleomenes also issued anonymous bronze coins. This suggests that Sparta’s domestic economy had evolved to function more like other Greek cities, with a need for small change in daily life. Cleomenes attempted to revive traditional Spartan institutions but understood the need to modernize the army, adopting Macedonian-style drill and equipment. He extended Spartan citizenship (previously limited to a tiny elite) to more residents of Laconia. Defeated in battle against the Achaean League at Sellasia in 222 BCE, Cleomenes fled to Alexandria, finding refuge at the court of Ptolemy III. When he failed in an attempted revolt against the succession of Ptolemy IV, he killed himself in 219. Nabis, a mercenary leader scorned by later historians as a brutal bandit, was the last ruler of an independent Sparta from 207 to 192 BCE. He came to power in a coup, having the last two legitimate kings executed. 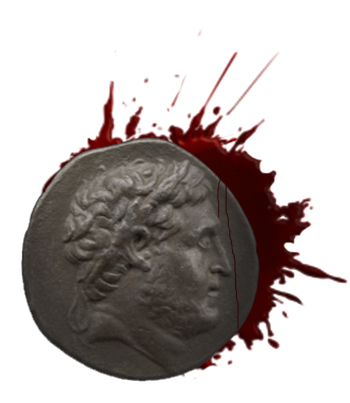 We see his grim visage crowned with a laurel wreath, on a unique silver tetradrachm acquired by the British Museum in 1896. On the reverse, a bearded, heavily muscled Herakles rests from his labors on a rock, holding his distinctive club. The upstart Nabis fought unsuccessfully against the Romans, who were increasingly drawn into the squabbles of Greek city-states, and he was assassinated in 192 BCE. Following the death of Nabis, Sparta was forced to join the victorious Achaean (or “Achaian”) League, a federation of some 40 cities and towns in the northern and central Peloponnese. Greek city leagues usually had a standardized currency (rather like the modern Euro), with a single obverse design but with the distinctive symbols and abbreviations of each member state on the reverse. The coins of the League were mainly silver triobols (also catalogued as hemidrachms, or half-drachma pieces). In the Greek system of weights, six obols equaled one drachma. A silver drachma was typically a day’s pay for a skilled worker; two obols would pay to feed a slave for one day. League coinage for Sparta is relatively scarce, suggesting that the population and economy of the city had declined sharply. In 146 BCE the Roman Republic, exasperated by constant bickering among the Greek leagues and independent city-states, finally abolished them. Greece did not formally become a Roman province until 27 BCE under Emperor Augustus, but the Romans were clearly in charge. 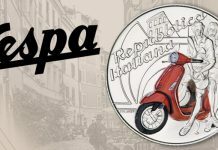 Under Roman rule, many cities were allowed to issue their own local bronze currency, with traditional designs. These coins are known today as “Roman Provincial” or “Greek Imperial”. In the civil wars (54-31 BCE) that brought an end to the Roman Republic, a Spartan named Eurycles fought on the side of Octavian (the future Augustus) at the decisive Battle of Actium and was rewarded with Roman citizenship. Spartan coinage was struck in the name of “C. Julius Eurycles” and his descendants as chief magistrates for three generations. Designs included idealized portraits of Lycurgus, the personification of Sparta as a young woman, and the Dioscuri – the twins Castor and Pollux – mythical heroes who also featured prominently on Roman Republican coinage. Romans admired the ancient Spartan virtues of asceticism, toughness, and conservatism, and Sparta became a popular tourist destination. Since goods and services in local markets were priced in bronze, visitors needed to convert their silver into local bronze, providing a profit for money-changers. Later Spartan bronze carried portraits of reigning emperors. 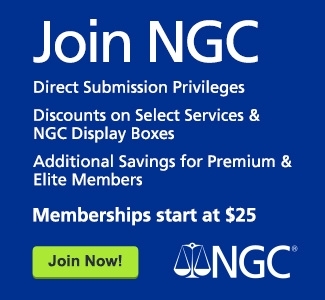 Examples are known for Augustus, Claudius, Hadrian, Antoninus Pius, Commodus, Septimius Severus, and others. Apparently, the very last coins issued by Sparta were in the names of Gallienus (ruled 253-268 CE) and his wife Salonina. Sparta’s coins are catalogued under the regional names “Laconia” or “Lacedaimon”, with many spelling variations. 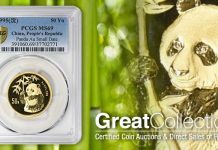 Royal coins of Sparta are rare to exceedingly rare and command high prices when they appear at auction. For example, the sole privately-held example of the tetradrachm of Areus sold for over $60,000 USD in 2009. 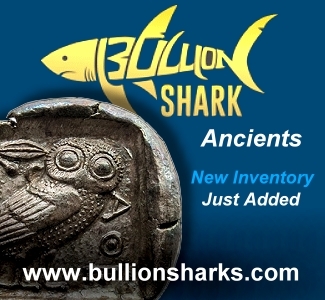 Achaean League issues are scarce, but can be found for a few hundred dollars. While not common, Roman Imperial bronzes of Sparta do appear in sales and typically go for $150-500. The standard reference book, in German, is Grunauer (1978). Still in print, the publisher offers new copies for €114 (US$161). Secondhand copies can be found for a bit less. Grunauer-von Hoerschelmann, Susanne. Die Münzprägung der Lakedaimonier.